by Andrea Boggio. Surrey, England: Ashgate, 2013. 279pp. $124.05 Cloth. ISBN: 978-1-4094-1907-5. Reviewed by Jeb Barnes, Department of Political Science, University of Southern California. Email: barnesj [at] usc.edu. COMPENSATING ASBESTOS VICTIMS offers an in-depth description of how four countries and three international corporations have responded to the epidemic of asbestos-related diseases. The book is not a parsimonious account of these responses, nor is it intended to be. It is richly detailed and nuanced, yielding insights that should be of interest to scholars of law, public policy, comparative legal systems and modern welfare states. Indeed, although framed as a socio-legal study that explores law as a form of cultural response, the book is more inter-disciplinary than that, drawing not only on socio-legal scholarship but also work from political science, comparative politics, public policy, and theory. 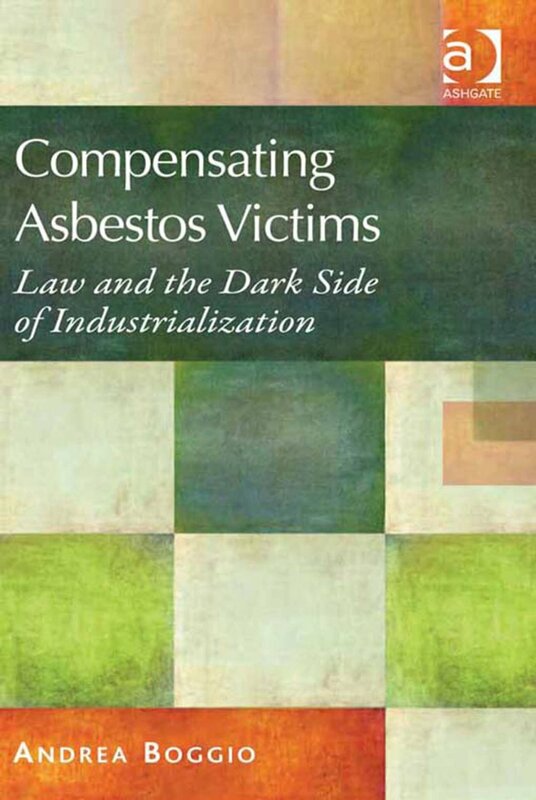 Given its multi-level case studies and theoretical breadth, COMPENSATING ASBESTOS VICTIMS is perhaps best understood as encompassing four inter-related analyses: one on the global asbestos crisis, another on comparative legal regimes, a third on how modern welfare states structure claims, and a fourth on the construction of the law by sophisticated corporate interests. Each is rooted in distinct literatures and each is well-worth reading, adding empirical depth to the study of the asbestos crisis, comparative legal systems and welfare state claiming practices while advancing our understanding of how powerful organizations shape public law through private action. As the book points out, asbestos exposure is not a problem of the past. It is an ongoing health crisis that “kills nearly one person every two hours in the United States, one every four hours in the United Kingdom, three every day in Italy and Germany, two every day in France, Japan, and Australia, and one every day in the Netherlands” (p.3). Yet scholarship on the asbestos crisis has largely focused on the response of single countries, often the United States or the United Kingdom. COMPENSATING ASBESTOS VICTIMS provides a welcomed corrective to this parochial tendency in the literature by detailing the policies of the U.S. and U.K. alongside two other countries that have a long (and tragic) history of asbestos use and illness: Italy and Belgium. Interestingly, he finds all of these countries, despite their obvious political, institutional and cultural differences, initially responded by channeling claims through their respective workers’ compensation programs designed to provide relief to employees injured on the job. The scope of the asbestos crisis, however, placed enormous pressure on these programs and, to varying degrees, victims of asbestos-related diseases demanded greater compensation. Over time, as pressure mounted in some of the countries, policy responses began to differentiate, as workers in the United States increasingly turned to the courts [*106] and tort system; British workers mostly sought to expand existing compensation programs while supplementing their compensation through private litigation; Italian workers fought for broader entitlements while the state brought a series of criminal suits; and Belgian workers continued to rely on (limited) workers’ compensation programs until 2007, when a modest Asbestos Victims Fund was created. The details of these case studies are must-reading for anyone interested in asbestos injury compensation issues, especially the descriptions of the development of the Italian and Belgian policies. More broadly, the book’s comparative case studies provide a lens into different national legal and regulatory styles. From this vantage, this book follows the tried-and-true formula of tracing different national responses to a common problem. Consistent with this literature, it finds that the United States tends to rely on greater levels of what Robert Kagan (2001) calls “adversarial legalism,” private litigation driven by the parties and their lawyers, while the European countries rely more heavily on “bureaucratic legalism,” social insurance programs administered by the state. The United Kingdom falls in between but the emphasis lies on administrative remedies. Although these findings are not surprising, they add a set of new cases to the useful store of knowledge about comparative legal systems and offer insights into the current debate on the extent to which European countries are converging on American-style adversarial legalism (Kagan 1997, 2007; Bignami 2011; Keleman 2006, 2011). Beyond scholars interested in asbestos injury compensation policy and comparative legal systems, COMPENSATING ASBESTOS VICTIMS should find an audience with scholars who study modern welfare states, especially how existing programs shape what is seen as a “deserving” claim. Similar to Stephen Skowronek’s classic (1982) on the development of the administrative state in the U.S. and later his work with Karen Orren on American political development (2004), Boggio begins with the idea that new claims are not made on a clean slate: they emerge within a set of established institutions and practices that have profound effects on the shape of emerging policies. The key point is that, in all of the countries, the initial framing of demands for relief as workers’ compensation claims (as opposed to more general welfare claims) insured a limited response that failed to cover workers’ spouses and children, independent contractors and people exposed to asbestos outside the workplace, all of whom have fallen victim to asbestos-related diseases in large numbers. In countries like Belgium, where the response remains centered on a relatively narrow workers’ compensation approach, this framing has proven particularly tragic. On this score, the book’s findings dovetail nicely with the large socio-legal literature on the “structuration” of claims (Giddens 1984) – perhaps more familiar to socio-legal scholars than political scientists – offering another striking example of how institutions deeply shape politics and policy. The national case studies in COMPENSATING ASBESTOS VICTIMS are valuable but somewhat conventional, applying existing concepts to new domains in thoughtful ways. What makes the book distinctive is its [*107] juxtaposition of these national case studies with an exploration of the responses of three transnational corporations: James Hardie, Cape, and Eternit. By shifting the level of analysis from the national to the organizational level, Boggio brings the insights of the law and society movement fully to bear. The gist is that these corporations unilaterally engaged in practices ranging from foot dragging to complex reorganizations across national lines that delayed and in some case avoided the payment of legitimate claims under the different compensation regimes. James Hardie, for example, sought to thwart victims by shifting its profitable operations away from Australia, where it was facing a growing number of lawsuits, to jurisdictions where Australian judgments would be hard to enforce. Cape and Eternit reportedly engaged in similar shell games, such as concentrating liabilities in thinly capitalized entities, stashing assets in friendly venues, like Liechtenstein, and continuing operations under the auspices of formally independent companies run by trusted allies. These descriptions demonstrate how seemingly technical private actions, such as corporate restructurings, represent efforts to retrench (already partial) public remedies for the victims of industrialization. The result is significant conceptual gains through “re-description” that recasts ostensibly arcane legal practices in political and policy terms (see Rorty 1989, p.9; Barnes 2007, 2011; Gillman 2004). This move builds on a growing literature that is bringing the study of law and courts back into the study of politics and welfare states by identifying the political and policy dimensions of phenomenon typically seen as the preserve of law professors and public law scholars, such as Silverstein’s (2009) re-description of legal precedents as an iterative framing mechanism of policy discourse; Epp’s (2009) characterization of administrative remedies against municipalities as a form of local governance and accountability; and Gillman’s (2002, 2006) re-interpretation of Supreme Court decision-making and judicial review as tools of partisan coalition politics. Certainly, after carefully reading Boggio’s account, no one could deny how public and private law are inextricably tied in the field of asbestos injury compensation and how the study of corporate practices enriches our understanding of the impact of social policies. If anything, COMPENSATING ASBESTOS VICTIMS could have further developed its discussion of these corporate activities and strategies, which is confined to a relatively short chapter (as opposed to the descriptions of the national responses that occupy full chapters for each country). In fact, the book powerfully argues at the outset that the use of nation-states as the unit of analysis is often problematic for studying policy responses to global problems, being both too narrow to capture transnational dimensions and too broad to capture critical dynamics at the local and organizational level (pp.24-25). Following this logic, the book could have provided greater balance between its analysis of formal institutions of the different nation-states and its explorations of corporate practices that shaped these institutions from the ground up, although the fact that Boggio presents both perspectives side-by-side in the same book is to be greatly [*108] commended. The bottom line is that COMPENSATING ASBESTOS VICTIMS provides a textured analysis of national and corporate responses to the global asbestos crisis. Along the way, it offers a salutary reminder that a de-centered approach to studying law and welfare states, one that accounts for both the development of national-level policy structures and organizational-level adaptations to these structures, is essential. Given its comparative, multi-dimensional and multi-disciplinary focus, the book should be read by a broad audience, including public policy scholars interested in the asbestos crisis, comparative legal scholars interested in different national legal and regulatory styles, welfare state scholars interested in how existing policies shape the framing of new claims, and anyone interested in meaningfully integrating law, courts and legal practices into the study of politics and policy-making processes. Barnes, Jeb. 2007. “Bringing the Courts Back In: Interbranch Perspectives on the Role of Courts in American Politics and Policy Making.” ANNUAL REVIEW OF POLITICAL SCIENCE 10:25-43. Barnes, Jeb. 2011. DUST-UP: ASBESTOS LITIGATION AND THE FAILURE OF COMMONSENSE POLICY REFORM. Washington, D.C.: Georgetown University Press. Bignami, Francesca. 2011. “Cooperative Legalism and the Non-Americanization of European Regulatory Styles: The Case of Data Privacy.” AMERICAN JOURNAL OF COMPARATIVE LAW 59(2): 411-461. Epp, Charles R. 2009. MAKING RIGHTS REAL: ACTIVISTS, BUREAUCRATS, AND THE CREATION OF THE LEGALISTIC STATE. Chicago: University of Chicago Press. Gillman, Howard. 2002. “How Political Parties Can Use the Courts to Advance Their Agendas: Federal Courts in the United States, 1875-1891,” AMERICAN POLITICAL SCIENCE REVIEW 96: 511-524. Gillman, Howard. 2004. “Martin Shapiro and the Movement from ‘Old’ Institutionalism to ‘New’ Institutionalism in Public Law Scholarship.” ANNUAL REVIEW OF POLITICAL SCIENCE 7:363-382. Gillman, Howard. 2006. “Courts and the Politics of Partisan Coalitions.” In THE OXFORD HANDBOOK OF LAW AND POLITICS. Edited by Keith Whittington, R. Daniel Kelemen, and Gregory Caldeira, 644–662. OXFORD HANDBOOKS OF POLITICAL SCIENCE. Oxford: Oxford University Press. Kagan, Robert A. 1997. “Should Europe Worry About Adversarial Legalism?” OXFORD JOURNAL OF LEGAL STUDIES 17:165-183. Kagan, Robert A. 2007. “The Americanization of European Law?” REGULATION & GOVERNANCE 1: 99-120. Kelemen, R. Daniel. 2006. “Suing for Europe Adversarial Legalism and European Governance.”COMPARATIVE POLITICAL STUDIES 39(1): 101-127. Keleman, R. Daniel. 2011. EUROLEGALISM: THE TRANSFORMATION OF LAW AND REGULATION IN THE EUROPEAN UNION. New York: Cambridge University Press. Orren, Karen and Stephen Skowronek. 2004. THE SEARCH FOR AMERICAN POLITICAL DEVELOPMENT. New York: Cambridge University Press. Rorty Richard. 1989. CONTINGENCY, IRONY, AND SOLIDARITY. New York: Cambridge University Press. Skowronek, Stephen. 1982. BUILDING A NEW AMERICAN STATE: THE EXPANSION OF NATIONAL ADMINISTRATIVE CAPACITIES, 1877-1920. New York: Cambridge University Press. Silverstein, Gordon. 2009. LAW’S ALLURE: HOW LAW SHAPES, CONSTRAINS, SAVES, AND KILLS POLITICS. New York: Cambridge University Press. Copyright 2014 by the Author, Jeb Barnes.